STEVEDORING prices in Australia have dropped to their lowest level in 17 years, according to the Australia Competition and Consumer Commission's (ACCC) 2015-16 Container Stevedoring Monitoring Report. A period of increased competition and investment infrastructure has resulted the lowest prices since monitoring commenced in 1998-99, says ACCC chairman Rod Sims. "Increasing competition between stevedores should deliver cheaper imports and lower costs for exporters and will see benefits flow through the whole economy," says Sims. New entrant Hutchison Ports Australia has established terminals in Brisbane and Sydney, while the incumbent stevedores (Patrick and DP World) have been upgrading and expanding the capacity of terminals as well as investing in automation and cranes. Competition will also be further enhanced at the Port of Melbourne when Victoria International Container Terminal (VICT) launches Australia's first fully automated terminal in late 2016. VICT also has the potential to service larger container ships which could substantially increase the capacity of the Port of Melbourne. The Maritime Union of Australia has welcomed the findings, but national secretary Paddy Crumlin says the report fails to mention the important role of labour. "It is disappointing that the ACCC hasn't identified the contribution of stevedoring labour and functional industrial relations on the waterfront in driving these strong results," says Crumlin. "The report found labour productivity was at its lowest in Brisbane, where all three container terminals are automated. The highest achiever, Melbourne, has no automated terminals. Industry margins and rate of return on assets are also at the lowest level recorded by the monitoring program. Productivity on the wharves has remained largely unchanged at close to record levels. However, Sims says there continues to be challenges for new entrants. "Hutchison has been operational since 2013 but is yet to attract adequate market share to match its investment in the industry. It is also possible that VICT may face some issues in establishing itself when it commences operations at the Port of Melbourne at the end of 2016," he says. The report notes that because of substantial investments by new entrants there is now infrastructure in place to support a third stevedore in each of the three largest container ports in Australia. 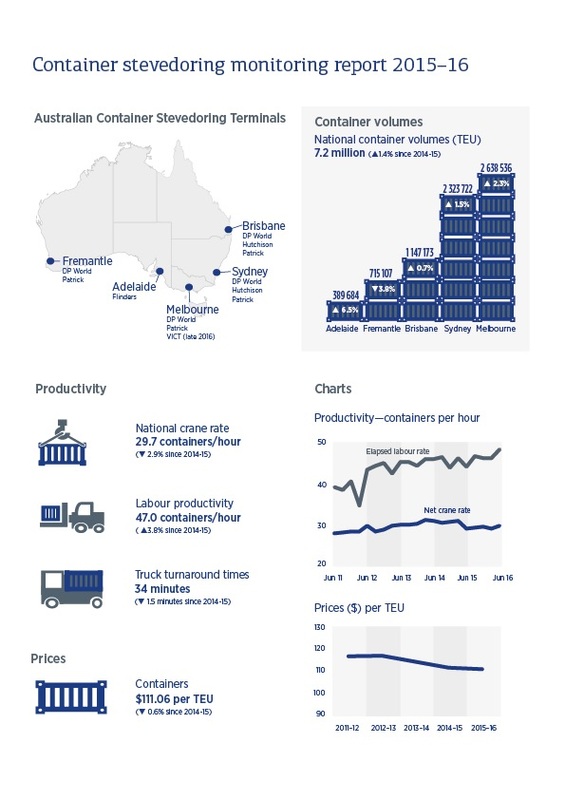 The report also notes that productivity levels at Australia's container ports remained strong. "In 2015-16 labour productivity reached a record level while capital productivity declined slightly from its peak last year," says Sims.